Gordon Strachan and Georgios Samaras have scooped a Celtic double in the Clydesdale Bank Scottish Premier League monthly awards for September. 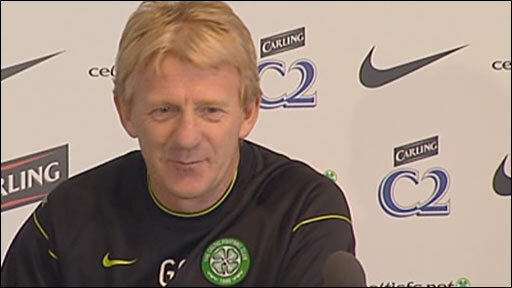 Strachan picked up the manager of the month award, while striker Samaras has been named player of the month. The Glasgow side secured three SPL wins in September, including a late comeback against Aberdeen at Celtic Park. Samaras is the SPL's top scorer with seven, netting twice in the league wins over Motherwell and Kilmarnock. Strachan said: "It's fantastic. I appreciate what the players have done. "It has been good to watch them enjoy themselves and to entertain people. "We have also had our opponents playing well and having a go. "Scottish teams are not doing too well in Europe. But, in term of the domestic game, I think it has been good." Samaras insisted he had already set aside the disappointment of missing a good chance as Celtic lost 1-0 to Villarreal in the Champions League on Tuesday. "It's my first award and I hope more of them will come," he said. "First of all, I must thank the manager and my team-mates because, without them, I wouldn't have won this award. "The only thing I can do is continue to work hard and help the team perform well and score goals. "I'm at a club where they really trust me, they respect me and that's really important for me. I don't need anything else. "I'm feeling good and I'm sure there's more to come. I'm never happy with myself. "I always want to improve and progress in my career and I want to do more things for myself and for my team."